La Jolla is our go-to destination in Southern California when we are in need of glorious waves, fine cuisine, elegant shopping, and, yes, exceptional wine tastings. 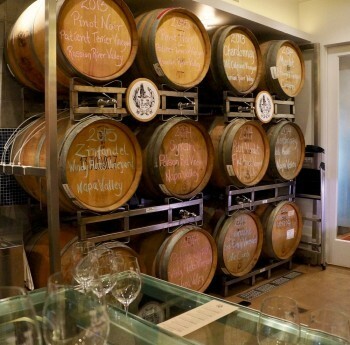 We recently savored two immensely enjoyable urban wine tasting experiences in La Jolla that were different from what you might find in traditional tasting rooms around California. 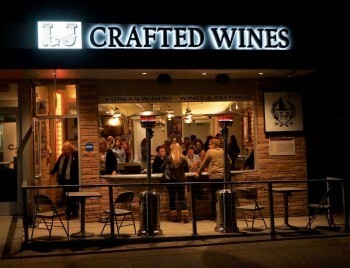 One was at LJ Crafted Wines, a stylish tasting bar that opened last year in La Jolla’s trendy Bird Rock neighborhood. Owned by Anne and Lowell Jooste, LJ Crafted Wines is named after Lowell Jooste (or perhaps after its La Jolla location or both). A South African native, Mr. Jooste, whose family managed Klein Constantia and Anwilka vineyards in Cape Town, harks from four generations of winemakers and winery owners so he brought a wealth of valuable experience to his new venture in La Jolla. The opening of LJ Crafted Wines was delayed by the 6.0 magnitude earthquake in Napa that destroyed most of the barrels of wine that Mr. Jooste planned to use to launch his winery in La Jolla. 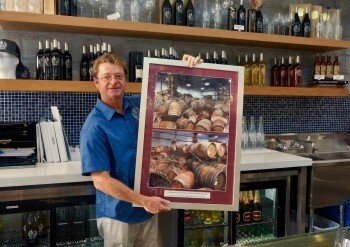 (See photo on the right of Lowell Jooste holding photo of destroyed wine barrels in Napa.) Always one to make lemonade out of lemons (or should we say wine out of grapes), Mr. Jooste salvaged the barrel staves from his destroyed barrels and used them as striking accents in the modern décor of his new chic wine bar. He also salvaged a 2013 Pinot Noir from Terrier Vineyard in the Russian River Valley—a wine that recently won a double gold at the prestigious Finger Lakes International Wine Competition. 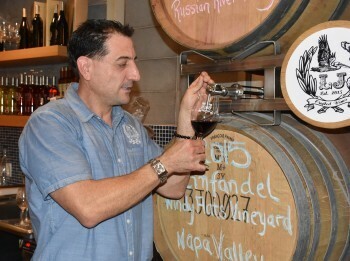 This winery is unique because its wines are transferred directly from the barrel into growlers (such as those reusable containers used in beer breweries), using the innovative Wine Steward, a patent-pending device created by Mr. Jooste that keeps oxygen from contaminating the barrel of wine when wine is poured into growlers. This inventive creation uses a stainless steel pipe that transports wine from the bottom of the barrel while a proprietary nitrogen and carbon dioxide mixture is pumped into the barrel to keep the wine fresh. Mr. Jooste’s motivation in creating the Wine Steward was in great part to reduce the environmental impact of the wine production process. The winery has a program where customers exchange their used growlers for freshly sanitized ones. The growlers themselves are beautifully designed and can also be special keepsakes. (I use one in my home as a lovely vase for flowers.) Some wines are also available in corked bottles. Grapes are from the Napa and Sonoma regions and LJ Crafted wines are produced in Napa by talented winemaker Alison Green-Doran, one of California’s first female winemakers. When the wine is ready to drink, it is shipped in barrels to LJ Crafted Wines. Customers can keep re-filling growlers with whatever wines they choose. Patrons can also enjoy tasting wines in the tasting room before they choose which ones to take home. The tasting room setting is contemporary and comfortable with a long bar and both indoor and outdoor seating. 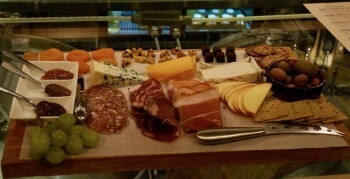 Small plates and lovely charcuterie platters are available to pair with the excellent wines. If you are lucky when you visit LJ Crafted Wines, you’ll have a chance to meet personable Lowell Jooste and also the winery’s knowledgeable Sommelier Derek Bacciocco who is an expert in describing the wines and the wine making process at LJ Crafted Wines. (See photo on the right of Mr. Bacciocco filling a wine glass directly from the barrel.) Both men love to tell the fascinating LJ Crafted Wine story. We have visited LJ Crafted Wines twice and particularly enjoyed the 2015 Windy Flats Zinfandel, a big, bright wine with tropical and cherry flavors; the 2014 Pinot Noir Rosé from Lakeview Vineyard in Sonoma, a nicely balanced light wine with hints of strawberry, raspberry and honey; and the award-winning 2013 Russian River Pinot Noir with floral aromas and subtle tastes of spice, vanilla and cherries. There are a variety of other tempting choices, which are also well worth trying. Somehow it seems to me that wines straight from the barrel have sharper, cleaner tastes. This may or may not be true, but perception is reality, right? LJ Crafted Wines is open Sunday through Thursday from 3 p.m. to 9 p.m. and from noon to 10 p.m. on Fridays and Saturdays. 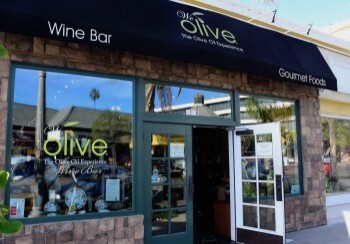 The other wine tasting experience I recommend in La Jolla is We Olive and Wine Bar. While there are other We Olive locations around California, the La Jolla location was the first to add a wine bar featuring small-production California wines. Located on Prospect Avenue right in the heart of walkable downtown La Jolla, We Olive is a welcoming venue where you can taste a variety of artisan olive oils, but you can also enjoy an impressive list of wines and a menu of enticing small plates. While you sip your wine and perhaps savor a delicious food pairing, you can either sit at the classy wine bar inside or perch outside on a small balcony with views of La Jolla’s gorgeous cove. It’s the perfect setting to take a break from shopping at La Jolla’s fashionable boutiques. Before retreating to the wine bar at the back of the shop, you should definitely sample a variety of the olive oils and vinegars available. All olive oils are of the highest quality and are California Certified Extra Virgin Olive Oils. We especially love the Meyer Lemon, Jalapeno, Blood Orange and Fresh Basil olive oils. Our favorite balsamics are Blood Orange, Blackberry, White Peach and Mission Fig. Try mixing and matching the oils and vinegars. The friendly and knowledgeable staff will help you create some delectable combinations while you taste. On various visits to We Olive’s wine bar, we have enjoyed a variety of delicious tapas and appetizers that pair beautifully with the wine bar’s extensive list of exceptional wines. I recommend a tantalizing Charcuterie Platter, an Almond and Olive Plate, and Proscuito-wrapped dates. Imaginative salads, paninis and flatbreads are also available. Many dishes are prepared or served with nicely matched olive oils and balsamic vinegars. The We Olive Oil store is open daily at 10 a.m. and the wine bar opens at 11 a.m.